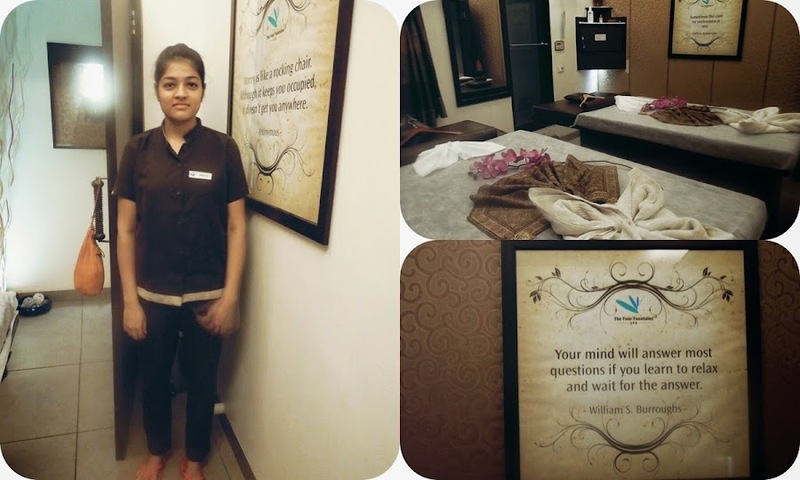 A day back I was invited over by the people at Four Fountains Spa,Delhi to experience a few of their services. Four Fountains is located right amidst the shopping indulgence of South Ex,New Delhi and It kinda serves as a girls perfect love me some day spa getaway , that too after a full day shopping swing ! From the minute we arrived, the staff was friendly and attentive to our every need,With the heavenly redolence of lemon grass ,and calm music to soothe every nerve before the therapy begins, they have the right ambiance to set the mood. Then goes on to your choosing the treatments bar and explanation about what actually is being recommended.The treatments are more result focused which ranges from their list down menu which was generally divided into 4 categories being-Detox, Immunity, rejuvenating, and beauty . I was amazed to check out the prices , as they were pretty reasonable, and much affordable as compared to other Spas,making it one of the most economical spa in Delhi area ! 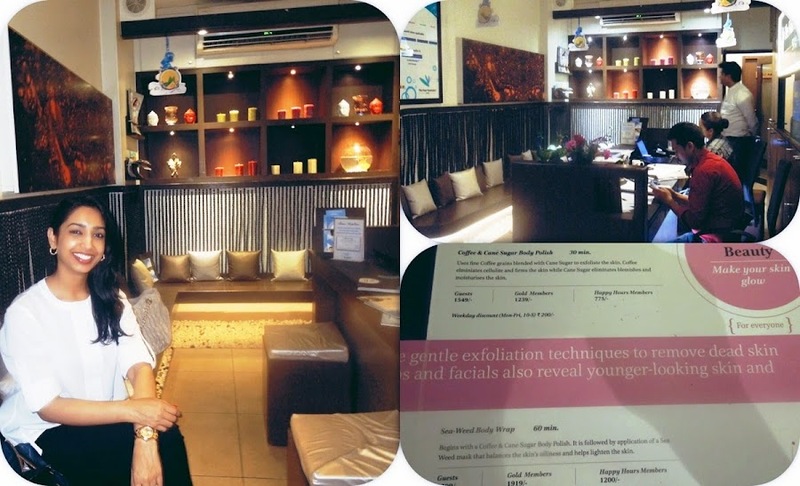 I chose to go ahead with a beauty trial with skin lightening facial massage-60 mins and body polishing-30 mins ! The treatment rooms are fairly big and spacious, dimly lit and music aligned to create the most relaxing atmosphere possible.The skin care products boast of natural ingredients to spoil oneself organically and awesomely. After a smooth rubdown of whole body with calming oil laden, coffee and cane sugar scrub(yummy), smaller pores and baby soft skin came as a result.It left me feeling new again,and my pores are thanking me for this gesture after the sun inflicted summer tan, took the better of my skin lately. Firdous was the lady assigned for my pampering, though a lil nervous knows her work well.The facial was so incredible and relaxing I fell asleep. Not only I got my black heads popped, but she also utilized the time while my pack dried to knead all my tense muscles. Though there was little conversation and she frequently asked me if the pressure/lighting/temp was right a few times(more than I expected which is good) . After the session , they serve their tea nice and hot, which I really appreciated.This review can go on and on, but let me just save more for rest of their services.I'm also eager to try the body treatments for immunity boost,and would probably switch for a different treatment next time - something with a little more pizzazz. 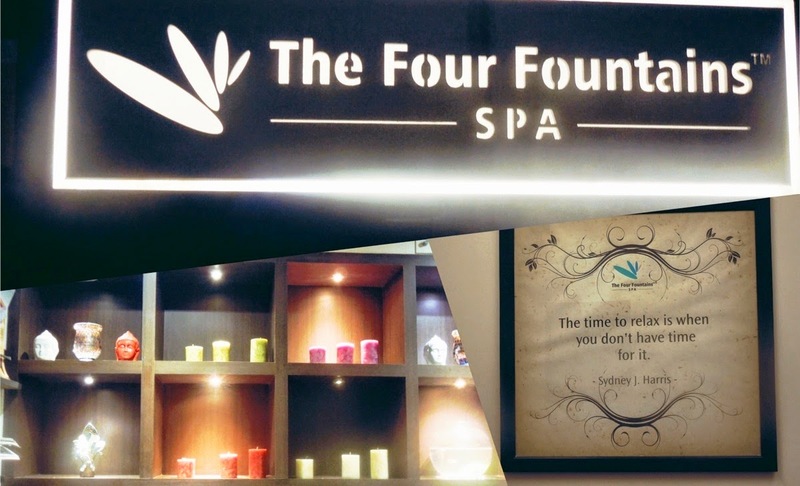 About Four Fountains Spa:Their vision is to keep India stress free through affordable spa therpaies. All therapies are provided in scientific and holistic manner. More than 25 massages,facials,bodypolishes,bodywraps and packages on menu.Prices start from 1699/- and weekday discounts and memberships are available.Open all days 8am-9pm. If you can click on the link in my last post! Looks like lots of fun and a wonderful place!